It was a mild winter, but it still feels wonderful to welcome spring. There’s lots happening on the North Shore food-wise, with new restaurants starting up and farm stands re-opening in many towns. But first, we need to congratulate the winners of the Warwick Film and Food Festival. Swampscott’s City Grill won the judges award for taste with their smoked beef short rib rillette with candied green tomato and soft polenta. Pickwick Baking Company was the big winner of the night, winning for best presentation and best film pairing (a Mad Hatter’s Tea Party a la “Alice in Wonderland”). 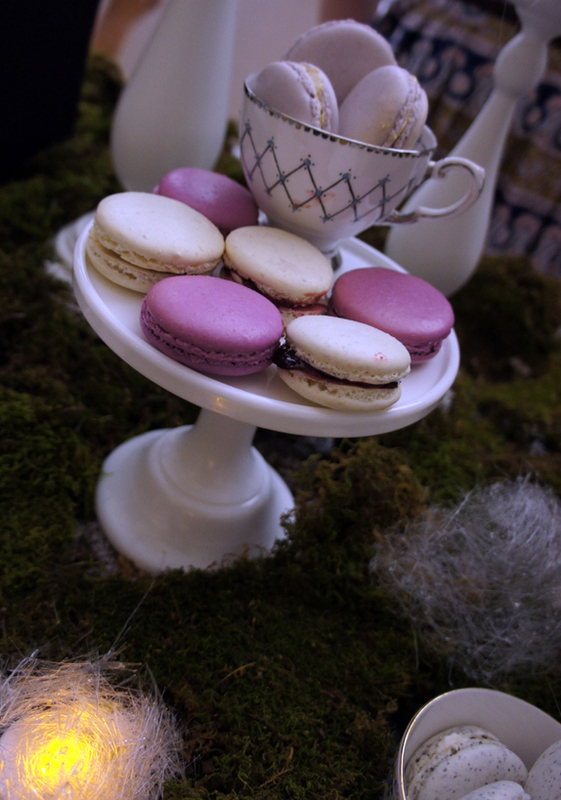 Pickwick’s Alison Ryan put her tantalizingly delicious macarons into a woodland fairy-tale setting that delighted the judges and the crowd. City and Pickwick tied for the Best of the Festival Award. Last but not least, Kappy’s Liquors won the people’s choice award for keeping Coppola wines flowing to match their “Godfather” theme. You can see photos of all of the awesome restaurants entries here. We start the restaurant news with the folks at Serenitee Restaurant group (Cala’s, Alchemy, 15 Walnut), who just opened Maggie’s Farm on Rt. 114 in Middleton. A pub-style restaurant, Maggie’s features starters like smoked goat cheese jalapeno poppers, roasted pork tacos, and crispy corn and crab cake. Entrees include seafood jambalaya, stuffed eggplant, and pan-roasted statler breast; there are also pizzas and sandwiches to choose from. Next, the Wenham Tea House has re-opened under the management of Henry’s of Beverly, with Peter Capalbo (owner/operator of Beverly’s Tryst) as the executive chef. In addition to breakfast, lunch, afternoon tea, and weekend brunch, the take-out options feature selections from Henry’s and loose-leaf tea from Hamilton’s Jolie Tea Company. They’re building a 70-person patio and will be holding wine dinners starting in the summer. Several new restaurants are coming to Salem, including Life Alive organic café in the former Coven location on Essex St., Orange Leaf Frozen Yogurt on Lafayette St., Something’s Brewing on Wharf St. (a new tea shop), and Three Potato Four on Washington St. (baked potato snacks with a variety of toppings). Endicott College’s School of Hospitality Management has announced their restaurant’s spring schedule. Dinners at La Chanterelle Restaurant begin at 6:30 and feature seasonal selections prepared and served by students. Call for more information and reservations: (978) 232-3040. You can also sign up for their mailing list. Three new food shops are opening in Marblehead. In Old Town, the Candy Pop Sweet Shoppe will feature penny candy, bulk candy, organic candy, vegan candy, sugar free candy, popcorn, and dessert pops, while Captn’s Bakery will offer artisan bread, bagels, cakes, cookies, cupcakes, and brownies. In downtown, Absolutely Fabulous will serve up specialty cakes on Atlantic Ave.
For those who can’t wait to buy local produce, Russell Orchards in Ipswich will open on April 28, Cider Hill in Amesbury will open on May 4, and Green Meadows Farm in Hamilton is open already with pansies, home-made treats, and lambs and piglets for the kids to see. And Swampscott is getting its own farmer’s market, located at the high school (200 Essex St) and open from 10am to 1pm on Sundays from mid-June to October.